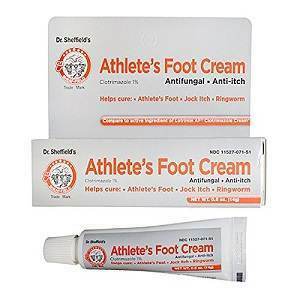 Dr. Sheffield’s Athlete’s Foot Cream claims to be an anti-itching cream that also cures fungal infections like athlete’s foot, ringworm or jock itch. Read on to learn more about Dr. Sheffield’s Athlete’s Foot Cream. The full list of ingredients for Dr. Sheffield’s Athlete’s Foot Cream is unavailable. The listing on Amazon claims that the cream contains both aloe and vitamin E. The product also contains 1% Clotrimazole as its active ingredient. Aloe and vitamin E are popular natural soothing agents for skin that is suffering from burns, infections or general irritation. Clotrimazole is a popular over the counter anti-fungal medicine which is commonly used to treat athlete’s foot, ringworm, jock itch and candidiasis. The exact dosage is not known for this product. To use Dr. Sheffield’s Athlete’s Foot Cream, clean the area you want to apply it to and dry it thoroughly before applying a thin layer of the cream over the infected area. Do this either twice a day or as directed by your doctor or pharmacist. This product is designed to be used daily for four weeks to treat athlete’s foot and ringworm. It is only to be used for two weeks to treat jock itch. This product should not be used on children under two years of age. If you are pregnant or breastfeeding, consult your doctor before using this cream. It is not yet known if the active ingredient used in this cream will pass into breast milk. This product is designed for external use. If you ingest it, inform your doctor immediately. If you are allergic to any of the listed ingredients or you suffer from allergies from other anti-fungal medicines, consult your doctor before using this topical cream. Clotrimazole can have several side effects such as stinging, burning, swelling, irritation, or flaky skin. If you find any blistering or oozing sores in the area in which you applied this medicine, talk to your doctor immediately because these are the rare but serious side effects of Clotrimazole. This product is available on Amazon. It comes in a pack of two .5 oz tubes of cream which costs $5.44. The guarantee for this product is uncertain and a manufacturer’s guarantee is not listed. Check with your local retailer to determine the return policy for this product. There is only one review listed on Amazon and it lists the product as having three stars but does not give a description. Dr. Sheffield’s Athlete’s Foot Cream is an over the counter anti-fungal medicine that is designed to treat not only Athlete’s Foot but also other fungal infections. It uses the most common anti-fungal products available from an over the counter pharmacy and it is also relatively inexpensive. However, there is no guarantee for this product and the length of time it takes to work fully can be up to four weeks. This means that if the product does not work for you, it may be several weeks before you realize it and you will not be able to get your money back. Jimmy Rodriguez	reviewed Dr. Sheffield's Athlete Foot Cream	on June 7th	 and gave it a rating of 2.5.